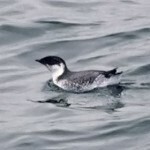 Description: Black crown and nape contrast with gray back; white below; white streaks on head and nape in breeding plumage; black chin and throat; small white-barred area at side of neck; yellowish bill. In flight, dark stripe on body at base of wing contrasts with white underparts and wing linings. Immatures lack head streaks, and the throat is mostly white. Habitat: Usually found on the open ocean. Nests on oceanic islets with enough soil for a burrow, often under heavy timber. Where in Nebraska: Single specimen record for Burt County. 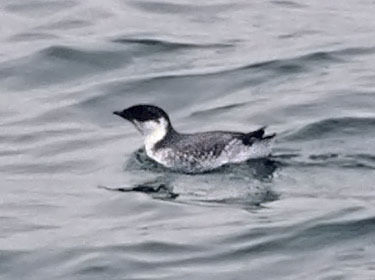 Fun Facts: Ancient Murrelet parents share incubation where each parent takes a shift usually lasting three days up to six days before switching.